We’d love your help. 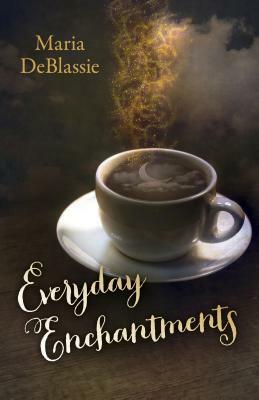 Let us know what’s wrong with this preview of Everyday Enchantments by Maria F. DeBlassie. To ask other readers questions about Everyday Enchantments, please sign up. Everyday Enchantments is exhilarating. A creatively personal self expression that is a self help book at the same time. There are few who will not have The Hair Day essay resonate to their very core (Mrs. N sure did). The author takes the daily mundane and crafts them into prose. This book simply screams to find JOY in your life. The simple things are profound. . . one just has to have the inner ability to understand that and appreciate them for more than what they seem to be. Those who feel a c Everyday Enchantments is exhilarating. A creatively personal self expression that is a self help book at the same time. There are few who will not have The Hair Day essay resonate to their very core (Mrs. N sure did). Those who feel a connection to the Universe and feel in communication with it, will love this book. A cozy read on a fall day, a comfortable read on a spring day. A book that awakens the soul. This is a book for all seasons. Maria DeBlassie's new book Everyday Enchantments is a very different read for me, this book is unique in the way it is written and presented. This book is very descriptive, narrative of the authors life. I enjoyed reading through it and the imagery that the words help to create a book that makes for wonderful guided meditation. This book may not be for everyone but it was has elements we can all appreciate and learn from. I loved the cover of this book. Don't buy this book if you want the same-old, same-old. However! If you are looking for writing that invites you to curl up with a cup of tea or coffee (or wine), then this is the book for you. DeBlassie offers up authentic musings that come to her in all sorts of ways...doing paperwork, waiting in traffic, doing dishes. All things are magical in her world because of her approach. She doesn't see the supernatural so much as she learns the world's hidden secrets, hears the trees whispered thoughts Don't buy this book if you want the same-old, same-old. However! If you are looking for writing that invites you to curl up with a cup of tea or coffee (or wine), then this is the book for you. DeBlassie offers up authentic musings that come to her in all sorts of ways...doing paperwork, waiting in traffic, doing dishes. All things are magical in her world because of her approach. She doesn't see the supernatural so much as she learns the world's hidden secrets, hears the trees whispered thoughts, and talks to nature's creatures. I wasn't sure what to expect when I received this book (at my request) from the publisher. At times, I didn't want to write a review or even talk about this book. It felt too personal. Too intimate. It was as if a dear friend sat down on my couch to wax lyrical on things mundane. What I found so intriguing and emotive about Everyday Enchantments was how easily I could identify with most of the small passages. The topics she picks to discuss are right on target with myself. Some things she discusses are books, tea and tea making, yoga, fresh fruit, rainy days, reading, snow days, the moon, New Mexico, the body, flowers, Coyote, and the seasons. There are so many points in this book where I can picture myself in my own home doing what the text is discussing whether it be reading in a comfy spot, watching rain fall on the windows, or making massive pots of soup to freeze for the winter. The ability to transpose myself in the passages she discusses made it a very personal book for me. I was taken aback with how beautiful the writing is even when it covers such seemingly mundane ideas. While this book is set up as prose, it reads like poetry. At times, passages seem to only be poetry as the word choice and descriptions are just too beautiful. This feels like a very feminine book; one that should be read by women of the world as to allow time and space for reflections. Reading this book and then using the author’s techniques for reflection on the everyday was the biggest takeaway for me. While I already do reflect on the mundane, this book has taught me that there is so much more ritual in my life and I do not see as ritual or special. In a way, it opens a door to appreciation of myself and where I am in the world today. Knowing that these two things will changes as days, months, and years go by, it is probably imperative to reflect as I go so I don’t loose sight. I enjoy reading books that make me stop and think about myself and what I’m doing versus whisking me off to another world or universe entirely. It’s like a refreshing break from real life while still being present in the moment. While the writing is well-done and the subjects are interesting, the only critique I have deals with the organization of the book as a whole. The subjects of each short piece really jump all over the place and cover so much, I feel like some sort of organization would be beneficial. Personally, division of the book by season would have been really beneficial. The author discusses all the seasons, but passages are so mixed up that it can be difficult to find a passage you might want to go back to. Luckily, each title is pretty descriptive. I feel like it would be easier to revisit seasonal pieces with the seasons, if there was some division or index accordingly. Maybe even organization based on subject would work. The only other critique deals exclusively with the eBook. At times, the headers where messed up or the spacing just wasn’t right. I could have been because I had an advance copy that wasn’t fully edited. It didn’t take away from the writing of the book, but was a bit confusing the first few times I encountered this problem. I would, without a doubt, recommend this book to others. While I think this book is probably directed towards women (I haven’t researching this), it could easily read by anyone with the interest. Everyday Enchantments can be a quick read or a drawn out one if you like; I read it over the period of a month so that I could enjoy it and savor the passages. On Goodreads, I gave this book four stars for its accessibly and poignant imagery. I was really able to get into the short pieces and take some good points away, so for me that is a winner! This book is so charming. I adore it ! I am soon to buy copies for Xmas presents and a hard copy for myself. This is a book to savor, to read daily, to highlight and make notes in the margins. This book should be part of all. of our daily routine. It is divine and exactly what we all need in today's crazy world. Everyday Enchantments is a lovely book created to make your world more beautiful, filled with joy and soul enriching. The author has penned a wonderful book of enchantments to our home a This book is so charming. I adore it ! I am soon to buy copies for Xmas presents and a hard copy for myself. This is a book to savor, to read daily, to highlight and make notes in the margins. This book should be part of all. of our daily routine. It is divine and exactly what we all need in today's crazy world. Everyday Enchantments is a lovely book created to make your world more beautiful, filled with joy and soul enriching. The author has penned a wonderful book of enchantments to our home and life that fill our lives with joy, complete our homes and fill our soul. Each chapter is short and sweet in the best possible Maria’s book is described as a collection of ‘micro-meditations and celebratory reflections on living life as a wild woman’. How could I not be intrigued? Though far from a true wild woman myself thanks to my urban-slash-suburban setting, I’m always drawn to the idea of being freer, away from the hubbub and city grind. This book holds chapter after chapter of golden, glowing moments from just such a life, and is as compelling as it is calming. EVERYDAY ENCHANTMENTS is like a book of poetry. It's a collection of essays written by Maria DeBlassie about everyday things (as stated in the title). From Eggs to Hair to Reading and so much more, this book brought memories back of things I had forgotten and things I have yet to discover. Each essay is about 2 pages long so it's the perfect book to read while sipping a cup of tea or when you have a few minutes between tasks. It is easy to put down after reading a few "chapters" and picking up a EVERYDAY ENCHANTMENTS is like a book of poetry. It's a collection of essays written by Maria DeBlassie about everyday things (as stated in the title). From Eggs to Hair to Reading and so much more, this book brought memories back of things I had forgotten and things I have yet to discover. Each essay is about 2 pages long so it's the perfect book to read while sipping a cup of tea or when you have a few minutes between tasks. It is easy to put down after reading a few "chapters" and picking up again later. On Mondays: "They are the ugly duckling of weekdays..."
I Live in Stories: "I live in stories because I am uncomfortable anywhere else." Sometimes I thought I understood how the book was put together because they seemed to be in "categories" and then something off topic would be written and I realized that it is just a book to enjoy, not analyze. Everyday Enchantments is basically a grouping of guided meditations based on the usual mundane tasks of everyday life. Read them when you want to relax, or when you want to remember the small miracles in life. I liked the sections on using herbs and the sections about reading books. Those were really the only ones that I could identify with. The sections on plants were very good too. The writing is beautiful, it’s relaxing and steadily paced. This book essentially guides you through the life of the author, therefore making it very personal. I didn’t identify with a lot of the happenings in this books, and I don’t think a lot of people will. It’s set in New Mexico, and while we have everyday tasks, that everyone can relate to, being gone through, we also have a lot of cultural stuff too. The cooking is very personal, the hobbies the author works on, reading and writing, it’s all so personal. I wavered on four or five stars on this one. There's a bit of a formatting issue, but that could easily be fixed. This one came preapproved for me on Netgalley, and my opinions are my own. This book resonated with my soul like the ring of a quality singing bowl. Filled with little reflections and meditations, you can feel the footprint of the original blog format, but the "bits and pieces" feel really matches up with how magic in our busy cluttered lives has to be snatched up, savored, and learn I wavered on four or five stars on this one. There's a bit of a formatting issue, but that could easily be fixed. This book resonated with my soul like the ring of a quality singing bowl. Filled with little reflections and meditations, you can feel the footprint of the original blog format, but the "bits and pieces" feel really matches up with how magic in our busy cluttered lives has to be snatched up, savored, and learned from in precious in-between moments when we honor ourselves and the natural elements of the world we so easily forget to value. Reading this made me feel like I knew myself better with each glimpse into the author's moments of magic. It's encouraging, and an inspiration to return to what makes myself and each of us powerful creatures that are more than our schedules, obligations, responsibilities, and titles. I chose to read this book because I thought the title was intriguing. Everyone is looking for an everyday enchantment, some ordinary magic in the normality of daily life. I wasn’t sure if it was going to be a fantastical story or memoirs of a modern woman, it turned out to be a bit of both in my opinion. Through a series of essays, Maria DeBlassie invites us to look at the everyday with new eyes, I guess you could say this is similar to the mindfulness trend that is so popular, or perhaps it’s on I chose to read this book because I thought the title was intriguing. Everyone is looking for an everyday enchantment, some ordinary magic in the normality of daily life. I wasn’t sure if it was going to be a fantastical story or memoirs of a modern woman, it turned out to be a bit of both in my opinion. Through a series of essays, Maria DeBlassie invites us to look at the everyday with new eyes, I guess you could say this is similar to the mindfulness trend that is so popular, or perhaps it’s one step further. I had never tried meditation, but I do suffer with anxiety so thought this book might be an easy way to try it out. I was not disappointed. Although it took me a good chapter to get used to the style of writing, the subject kept me turning the pages. I also found myself wanting to go back and reread certain sections. It will not be a one off read for me, hopefully it is the start of a journey. I give Everyday Enchantments: Musings on Ordinary Magic & Daily Conjurings by Maria DeBlassie, 4 stars. This is a book that shows you many things. It is a collection of writings by an author who finds the happiness in the small things. She makes the everyday seem like magic. There are snippets in here of just about everything. From morning to evening, there is so much that we could be reflecting on, so much to be thankful for. The author shows you how to see things differently. This is somethi I give Everyday Enchantments: Musings on Ordinary Magic & Daily Conjurings by Maria DeBlassie, 4 stars. This is something completely different than what I would normally read. This may fall under the category of self-help or spiritual. But the author is not telling you what to do or think. She is just reflecting on things in her life in a way so you understand. Mainly, this is a book to show you that you can see things in different way. Written in short snippets, it isn't something you have to necessarily sit down and read in one sitting. You could pick it up for a few minutes here and there and learn something new. This book is a grown up version of the chicken noodle soup series. Too often do we just skip over the joy of the small things in life, but this author has written a collection of essays that takes part in those joys. This book was an invitation to sit back, read and relax. Many times I am rushing to get to the conclusion of the book, but this one, it was such an smooth, easy read that you felt wrapped inside the book and within the stories. You get a real understanding of this author, Her feelings, her emotions, wants and desires. She doesn’t impart her opinion on you, nor does she try to pass judgment. She just is, and she lets things be, and other times, with a bit of sage, she does some mass cleaning. I loved this book. This is not my normal genre, but I think I have found a new favorite. The book Everyday Enchantments: Musings on Ordinary Magic & Daily Conjurings by Maria DeBlassie is a book that I enjoyed reading. It draws you in and I found myself not wanting to put it down until I had read the last page. It is a book that is amazing with the advice that it gives and inspirational as well. It has you realizing that it is sometimes the small things in life that can mean so much. You learn how to get joy from everyday things and how you may need to change the way that you think about everyday events. I found the examples given to be wonderful and this is a book that I found myself thinking about long after I had finished reading it. This is a book that warmed my heart and has many feel-good moments. It is amazing. It is wonderfully written and a book that I would recommend reading. This is the perfect companion book for the person who loves to get lost in nature. Finding joy and peace can be difficult in this day and age but one of my favorite activities is sitting on my porch with a cup of coffee in the morning and just listening. The serenity I can find for a few moments in the silence of the early morning is exactly the kind of thing this book is about. You don't need to participate in any particular religion or lack thereof to appreciate what Maria DeBlassie has put to This is the perfect companion book for the person who loves to get lost in nature. Finding joy and peace can be difficult in this day and age but one of my favorite activities is sitting on my porch with a cup of coffee in the morning and just listening. The serenity I can find for a few moments in the silence of the early morning is exactly the kind of thing this book is about. You don't need to participate in any particular religion or lack thereof to appreciate what Maria DeBlassie has put together. While her particular flavor is Southwest USA, anyone from anywhere can gain perspective or at least find instances to appreciate the magic in everyday life. This is not something I would normally read but am so glad I did, it was awesome, and even though it's not my normal choice of reading it was definitely interesting and had me walking away from it thinking more about things that happen in my everyday life...How even though I try not to I absolutely take so many things for granted. It's so easy to get caught up in the rat race of life and because of some of the stories in this book I will be looking at things a little differently from this point on. The writing in this book was beautiful and flowed smoothly, it was nice for a change to not have an ongoing story that doesnt give me time to break. I will definitely be checking out more from this author. Everyday Enchantments: Musings on Ordinary Magic and Daily Conjurings by Maria DeBlassie is a book designed to get you thinking in a different way. This book is one that was written in a different style to that which I am used to reading and I found that refreshing. I loved that the book was almost in nice little bite sized chunks for you. For myself, running around after a one year old, it made it so much easier to read. I could pick it up and put it down easily, falling straight back into the a Everyday Enchantments: Musings on Ordinary Magic and Daily Conjurings by Maria DeBlassie is a book designed to get you thinking in a different way. This book is one that was written in a different style to that which I am used to reading and I found that refreshing. I loved that the book was almost in nice little bite sized chunks for you. For myself, running around after a one year old, it made it so much easier to read. I could pick it up and put it down easily, falling straight back into the authors rhythm every time I did. It really helps you to reflect on your everyday life and news ways of thinking about things. I couldn't relate to much of this book, but I am betting it's audience in the southwest U.S. will enjoy it! I thought it might be similar to Simple Abundance by Sarah Ban Breathnach, you know feel good book but updated to 21st century. And it is- to a degree. I mean yoga and tea figure a great deal in this book as do good for you foods. Maybe folks who enjoy those things will enjoy this book, too. But so much adobe and dessert in northeastern Ohio, really doesn't make much sense. I liked Simple I couldn't relate to much of this book, but I am betting it's audience in the southwest U.S. will enjoy it! I thought it might be similar to Simple Abundance by Sarah Ban Breathnach, you know feel good book but updated to 21st century. And it is- to a degree. I mean yoga and tea figure a great deal in this book as do good for you foods. Maybe folks who enjoy those things will enjoy this book, too. But so much adobe and dessert in northeastern Ohio, really doesn't make much sense. I liked Simple Abundance better, but maybe my age is showing! It sounds so magical- Everyday Enchantments- but I couldn't find any between it's page. Sorry. This was such an interesting read, when I first read the blurb I honestly didn’t know what to expect but I soon found myself really captivated by what they author was writing about. It is really well written and the author had this amazing way of drawing me into her life. It was nice to read something a little different and in a world where everyday life is so busy and stressful this book certainly made me stop and think about things. I find meditation really relaxing and it has helped my anxiety a lot so I really did find this book useful. A unique and different read that I really do recommend and is definitely one of those books you should go into with an open mind. Maria de Blassie is a tradition of her own; yet her mystical approach reminded me of two disparate female authors: Sarah ban Breatnach of SIMPLE ABUNDANCE, and Clarissa Pinkola Estes, psychotherapist and author of WOMEN WHO RUNS WITH THE WOLVES. All three auhors take different approaches, yet all three inspire readers to cast aside logic and rationale in order to seek out, find, and then apply the Truth. Everyday Enchantments is a great inspirational read by Maria F. DeBlassie. It’s short and sweet and full of stories about life’s little treasures. It’s an incredibly detailed read, I was able to picture everything playing out in my mind as Maria describes everything from scents, emotions and even to the smallest of details, which made it highly entertaining. It’s books like these that I love reading as they open your eyes to everything we take for granted and allow us to remain present and living fully in the moment every single day. I fully enjoyed this read and would recommend it to anyone looking for some daily inspiration! I received an ARC of this book from Netgalley and John Hunt Publishing Ltd for free in exchange for an honest review. I thoroughly enjoyed Everyday Enchantments. Each mini essay was a lovely meditation on the magic of ordinary moments. Whether it is the joy in a stolen moment for yourself or the meditative quality to be found in daily tasks, Everyday Enchantments is a gentle reminder to be mindful of the joy and magic that daily life is bursting with. I can easily picture myself returning again an I received an ARC of this book from Netgalley and John Hunt Publishing Ltd for free in exchange for an honest review.